Barney and his best friend Norma are just trying to get by and keep their jobs, but working at the Dead End theme park also means battling demonic forces, time traveling wizards, and scariest of all--their love lives! About the Author: Hamish Steele is a freelance animation director and illustrator who grew up in Somerset surrounded by legends, myths and folktales. Since graduating from Kingston University in 2013, Hamish has worked for the BBC, Cartoon Network, Disney, Nickelodeon, among others. Hamish currently lives in London. Noteworthy experiences while reading this book: When I saw the cover and I found out they were giving and signing copies. I was extremely excited to read this graphic novel from what its plot and art style looked like. Do I Recommend this book? 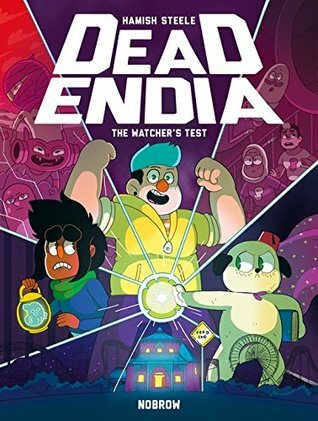 Yes, I would totally reccomend this title to readers who love graphic novels, fantasies, as well as creatures and beings from other worlds and PUGS!! The world isn't much diffrent from ours. The only real different is the extreme supernatural activity with demons , angels, and dimensional pugs. The ending was happy and it was open for another book. I hopefully get the next book so I continue with the series.